Leaf litter is a big and important part of Red-backed Salamander habitat. The loss of trees means less leaf litter. Most of the habitat loss is due to the development of forest lands for urbanization and suburbanization. Forestry also impacts their habitat. After timber harvests, local salamander populations decrease and take a long time to recover. Salamanders respond a lot to very local habitat features, so you can make a big impact in a small area. Forest management practices can decrease their impact on red-backed salamanders by increasing coarse woody debris on the forest floor. In forested areas, retain leaf litter for natural cover to protect the salamander’s forest home. You can also use rocks and logs in landscaping. Warmer temperatures mean salamanders have to spend more time hiding under rocks/logs or underground instead of foraging or courting. Warmer temperatures also mean salamanders have less energy to spend on growth and reproduction. Lastly, unpredictable precipitation will also restrict salamander surface use because they need wet conditions to breath. Red backed salamanders use forest floors and actually spend a portion of their lives underground. These salamanders are also freeze intolerant, which means that they do not survive freezing events. In the winter, when these salamanders are underground, the snow acts like a buffer for the soil (think of a big white blanket on top of the soil). When there is snow on the ground, only a small portion of the top layer of soil freezes. When you remove that snow, the soil freezes deeper. Current research is studying how this may impact salamanders. Pollution comes from urban, industrial, and agricultural runoff. Pollution can alter soil chemistry, which is particularly bad for Red-backed Salamanders because of their sensitive skin. Pollution can also kill off important prey species for salamanders, like springtails. Reduce your use of chemicals and dispose of them properly to help reduce their flow into salamander habitat. Invasive earthworms, introduced from Europe, have spread throughout the region, often because anglers discard the worms they don’t use as bait. These worms reduce soil moisture, which is bad for both the salamanders and the small arthropods they rely on for food. Don’t use worms as live fishing bait, discard worms in landfills, and don’t transfer soil. Learn more. There is little evidence that any of the three major emerging amphibian diseases (Ranavirus, Chytridiomycosis, BSal) impact Red-backed Salamander. In fact, there are studies that have demonstrated that red backed salamanders can actually fight off diseases like Chytrid! Wash your shoes and equipment after every hike, fishing trip, or visit to wetlands. You can help reduce the spread of these deadly diseases and fungus!! Learn more here. Intact deciduous forest, preferably mature, with leaf litter and woody debris for the salamanders to live under. This species spends part of its time at the forest surface and then part of its time underground to deal with either hot, cold or dry conditions. It is entirely terrestrial and is active in the Spring and Fall. It takes about two years for a salamander to become reproductively mature, and females typically lay eggs every other year across most of the range. They spend a significant portion of their lives underground. They eat anything they can fit in their mouths, but mostly they eat arthropods living in and on the soil. They are one of the most abundant and widely studied salamanders in the U.S. Among the most interesting aspects of Red-backed Salamander natural history is that they have direct development of their offspring. This means that tiny salamanders hatch from eggs, as opposed to having an active larval form, which then metamorphoses into an adult. Because of this, red backed salamanders do not have large individual home ranges, compared to other salamanders. Another point of mystery for this species is that it is polymorphic (meaning that individuals may look different, but be the same species). The two most common forms of Red-backed Salamander are the red-stripe and lead-back forms. SPARCnet is a great example of a network of partners coming together across the entire range of the Red-backed Salamander and using standardized methods to monitor how the species is doing. 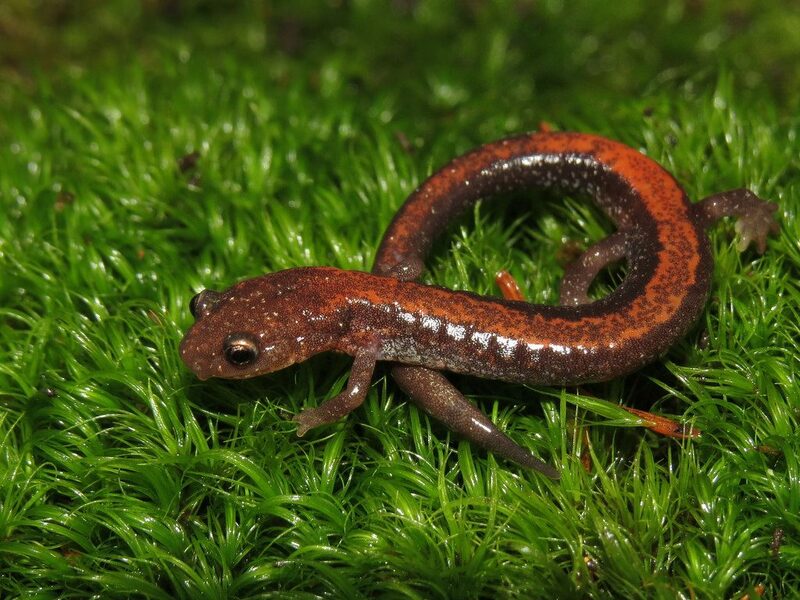 I have been asked to provide some comments on the report card for the red-backed salamander. Looking over the report card, the majority of the information is very general, but accurate. I would imagine this is the goal of the report card, to make it engaging and accessible for all readers. Nice work on that aspect! Here are some minor suggestions on a few sections. Habitat Loss: I am studying the effects of landscape change on red-backs, and some of my initial findings have backed up what you have here (and what is in the literature) that leaf-litter is the big driver. I think that as part of the habitat loss section you might want to include a bit about how some forest management that increases the amount of coarse woody debris on the forest floor can have a positive effect on RBS numbers. Might also include something about how they really respond more to local habitat features than regional features. Pollution: The only suggestion I might have here is to mention that pollution that impacts and alters soil chemistry is particularly bad for RBS. Similarly, any soil pollution that impacts populations of small soil invertebrates, like springtails, can negatively impact RBS. I have been wanting to get some funds to do some soil chemistry tests at each of my sites, but so far havnt been able to – if that is something you want to help with that’d be great! I hope these brief comments help. Thank you for your comments! We’ve updated the report card to reflect the additional information you provided. Please let us know if you have any other comments.